To mark its 500th issue, NZ Catholic invited its three former managing editors to write 500 words on the challenges the paper faced during their tenures, how these challenges were met, and to mention the major stories that were covered in those years. Pat McCarthy (1996-2005), Gavin Abraham (2005-2010) and Peter Grace (2010-2016) graciously agreed to this request. NZ Catholic thanks them for their articles, and for their past leadership of the paper. It was not the best of times to launch a national Catholic newspaper. At Easter 1996 the weekly New Zealand Tablet had ceased publication. By September, when the monthly New Zealandia published its last issue to make way for the fortnightly NZ Catholic, naysayers were predicting a short life for the new publication. Gloomy predictions about the future of the Catholic press were underscored by a “Can anything good come out of Auckland?” wariness in the deep south. For a year the boards of the Dunedin-based Tablet and the Auckland-based New Zealandia, both with falling circulations, had been negotiating a possible merger. These talks were still going on when the Tablet board decided to cease publication. Yet the word was spread in the south that the Tablet was forced to fold because the Aucklanders had broken off discussions. In the vacuum left by the Tablet’s closure, the New Zealand Catholic Bishops Conference had sponsored a survey to assess Catholics’ desire for a new national newspaper — but only the most optimistic could have envisaged a practical outcome. Nevertheless, when Bishop Patrick Dunn and his board decided to go it alone, many influential Catholics would have agreed with the archdiocesan paper Wel-com’s assessment that Auckland diocese had “jumped the gun”. Then the first issue of NZ Catholic stoked the Dunedin-Auckland friction with its lead story reporting the decision to move the national seminary, Holy Cross College, from Mosgiel to Auckland — a blow Dunedin Bishop Len Boyle said was worse than the loss of the Ranfurly Shield. When that first issue arrived from the printer, my diary notes, “comments from around Pompallier Centre were very favourable”. By next day some parish priests were ordering more copies. Six issues were produced in 1996 by an editorial staff consisting of myself (full-time) and journalist Dorothy Coup (part-time). It was an intensive effort, often requiring work past midnight and struggles with computer, Internet and printing problems. Our reward came when the Australasian Catholic Press Association awarded us its top newspaper trophy, the Bishop Phillip Kennedy Memorial Award, for those six issues. “This publication has made a first-class start. An all-round professional product . . . ,” the citation said. Over the next several years we gained more than 50 similar awards, for excellence in both content and design, which we hung on office walls to inspire staff. We put a lot of work into good design, and in 2001 the international Society for News Design named NZ Catholic as one of the best-designed small newspapers in the world. At the end of 1997 I expressed my appreciation for the “almost universal co-operation and openness of people at all levels of the Church when we approach them for information, even on touchy subjects”. The change since I previously worked in Catholic journalism nearly 30 years before – the Cardinal McKeefry-Archbishop Liston era — was remarkable. of the theological basis for Catholic media — that a community comes into existence through communication, and the community of the Catholic Church needs Catholic media to hold it together. — Pat McCarthy was founding editor of NZ Catholic. 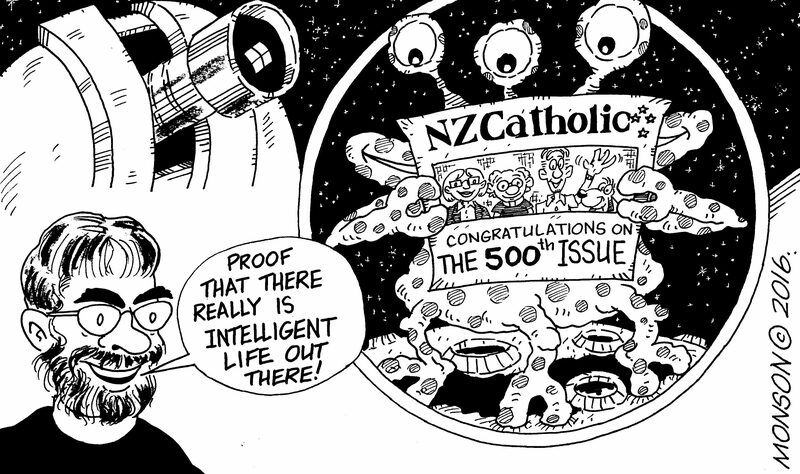 As NZ Catholic stops to celebrate its 500th issue, it is an appropriate time to reflect on the newspaper and the Catholic media more broadly. I spent five years at NZ Catholic, most of it as managing editor. It was one of many subjects that I came to consider in great depth over my time at NZ Catholic. As much as my five years provided a learningexperience professionally, it was also a learning experience personally and spiritually. I was able to grow in those diverse ways thanks largely to the two Pats: Bishop Pat Dunn and founding editor Pat McCarthy. In the mid-1990s, Bishop Pat saw a need for the reestablishment of a Catholic newspaper. As the plan to create a national masthead dragged on, he forged ahead with a plan for an Auckland newspaper with national coverage. With a consummate professional like Pat McCarthy to lead NZ Catholic in its first decade, Bishop Pat knew he could entrust his newspaper to someone who would take seriously the duties and responsresponsibilities that came with the territory. When I took over as managing editor in late 2005, Bishop Pat’s commitment to a newspaper that looked at the Church “warts and all” and Pat McCarthy’s journalistic integrity and diligence had created a publication that was the envy of many working in the Catholic press. Fellow editors saw in NZ Catholic something they wished they could emulate. Many Catholic publications were and are hamstrung by the Church hierarchy. Every article must be run through a vetting process. In many places, coverage of the Church’s flaws is forbidden. Bishop Pat, with a trusted editor in Pat McCarthy, knew that wasn’t good enough. The best Catholic newspapers are typically those that present the Church as it is, not as we wish it were. In my four years as editor, on the rare occasions when I sought his counsel on editorial decisions, Bishop Pat always erred on the side of open debate and dialogue — even when he knew it would cause him headaches. There were headaches at the operational level for the staff, too. NZ Catholic was not immune from the challenges that all print publications face. Those challenges largely remain. Questions continue to be asked about the viability of Catholic newspapers and magazines. They should be asked. world is as important as ever. Gavin Abraham is currently communications manager for the National Catholic Education Commission in Australia. When I became NZ Catholic’s third editor, in May 2010, Pope Benedict XVI had been guiding the Church for just over five years – and smartphones and “the cloud” were starting to take off. Pope Benedict was to create the biggest story during my 74 months as editor. On February 11, 2013, Pope Benedict announced that he had decided to resign. His resignation, the first by a pope in about 500 years, took effect on February 28. That led to the second-biggest story of my time — the ongoing shake-up of the Church following the election of Archbishop Jorge Bergoglio of Argentina as pope. He took the name Francis and made an immediate impact through his use of metaphors. Who will forget his message to priests to work so they too carry the smell of their sheep? Francis has also had a huge effect through actions. He hadn’t been Pope for long when, during Holy Week, he washed the feet of 12 young offenders — 10young men and two women. Those images flashed around the world to be published virtually everywhere. Other significant events were World Youth Days, the Year of Consecrated Life from Advent 2013 to the Feast of Christ the King, 2014, and the canonisation of Popes John Paul II and John XXIII in April, 2014. In October 2010, Mary MacKillop became Australia’s first canonised saint, known as St Mary of the Cross MacKillop. Sexual Abuse began holding hearings around Australia. The Catholic Church is at or near the centre of those ongoing hearings. In New Zealand, the second major Canterbury earthquake, on February 22, 2011, killed 185 people. NZ Catholic flew contributors into Christchurch to report on this disaster. Between 2011 and 2016, two bishops were ordained in New Zealand, and two died. The announcement of the appointment of Msgr Charles Drennan of Christchurch as coadjutor Bishop of Palmerston North came in February, 2011. He was ordained as bishop in June that year and was installed as Bishop of Palmerston North in February, 2012. A West Coast priest, Fr Stephen Lowe, was ordained as Bishop of Hamilton on February 13, 2015, succeeding Bishop Denis Browne. Bishop Barry Jones of Christchurch had several strokes, and while there was initial hope that he would recover, he declined and died on February 13, 2016. The Bishop Emeritus of Dunedin, Bishop Len Boyle, also died in June this year. Major challenges since 2010 were fighting for circulation as a growing proportion of our Catholic population has English as a second language, and introducing new initiatives when staff were already flat out with the newspaper. One of my hopes is that NZ Catholic will be able to make increasingly creative use of cyber-technology. Will this include a form of electronic publication? And maybe software like Mail Chimp can be used to keep maintain a more personal contact with groups significant to NZ Catholic? NZ Catholic is important to the local Church. I wish it well.